I'll keep this short and sweet - congratulations to Selena, you've won my KKCenterHk giveaway! 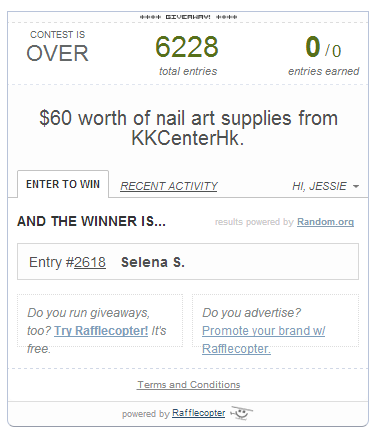 $60 worth of nail art supplies will be sent to you as soon as I get your address. 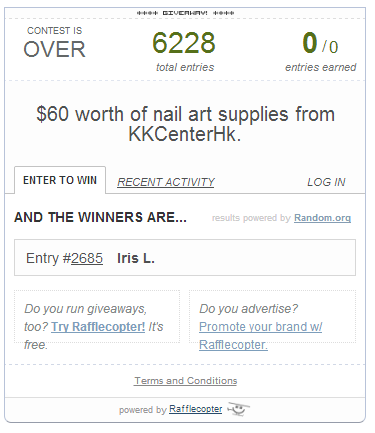 I'll give the winner a week before I re-draw, but I'm sure she'll reply to my email in time! To everyone else - don't worry, I've got another MASSIVE giveaway with heaps of winners coming soon. It starts when I reach 10,000 likes on Facebook. I'm close to 9,800 now so go get your friends to add my page to help the giveaway come sooner ;).